Why we have Perpetual Eucharistic Adoration? Because Jesus wants it! “Could you not watch one hour with Me.” Matthew 26:40. But we too have needs, hurts, joys, and sorrows that we can share only with Our Lord and Savior. By coming to Adoration we give Jesus great honor and act with humility by acknowledging our need for, and dependence upon Him – Our Creator. A wide variety of hours at different times of the day are open. You are invited to try Adoration. Please call Kathy Wichmann at 794-6592 for further information. God bless you! Perpetual Adoration is everyday except Saturday, when it is at Divine Providence Home Chapel from 8:00am-8:00pm. There is no Perpetual Adoration during scheduled Masses at St. Mary's Church. St. Mary's Church is locked during the night from 6pm-6:00am. For evening Adoration you can obtain a code from the parish office at 794-4171 during business hours. Eucharistic adoration is the act of worshiping God as Jesus is present in the consecrated host. Since the last Supper, when Jesus broke the bread and distributed the wine, saying, “This is my Body” and “This is my Blood,” Catholics have believed that the bread and wine are no longer merely bread and wine, but the actual living presence of Jesus, the second person of the Blessed Trinity. Spending time before the Blessed Sacrament, in prayer and devotion, is exactly the same as spending time before the living God. Adoration of Jesus occurs whenever a person genuflects recognizing Jesus present in the tabernacle, bows before receiving Holy Communion, or when the Blessed Sacrament is exposed for adoration. This devotion begins with exposition of the Blessed Sacrament. The sacred host is removed from the tabernacle and is placed on the altar for adoration. The purpose of adoration is to highlight the presence of Jesus in the Eucharist. The consecrated host is placed in the monstrance which is placed on the altar. 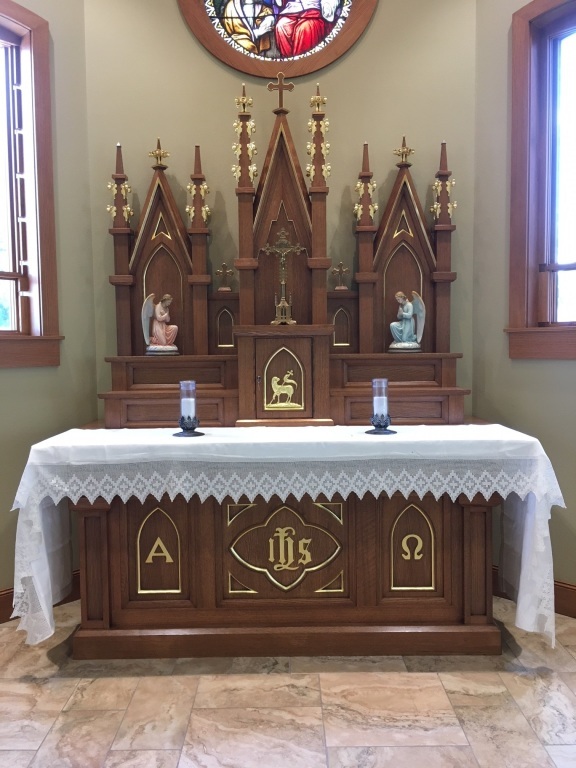 Thank you for the generous donations given to make this new Altar possible.